Another 4 days to 2018! Wow. This year, I've been pretty good with breaking out of my comfort zone and trying out different skincare products so now I'm back with another set of skincare products that I'm currently testing out. Just for reference, I have oily yet dehydrated skin and I have uneven skin texture with quite a few acne scars on the cheek area. This is a serum that is said to help hydrate the skin while targeting and breaking down the pigmentation and stopping future melanin (which causes the dark spots on the skin ultimately) formation. It also contains anti-inflammatory and anti-aging ingredients. The serum is housed in a silvered bottle and while the packaging is great in prevent light and air exposure which could degrade the active ingredients, I do wish that the packaging is slightly thinner which will make it easier to travel with. Besides that, this is a lovely serum that I've been enjoying. Texture wise, this is an almost opaque liquid with about medium viscosity such that it doesn't drip. It does go on nicely onto the skin and gets absorb pretty quickly on the skin. I like that it is lightweight and does not leave any residue on the skin which can be quite uncomfortable for some people. In terms of hydration, I'd say that this does a good job. I use this every morning and my skin does not feel tight from dehydration (especially around the cheeks where I can feel it the most) throughout the day, despite being in an air conditioned office for hours. So far so good! 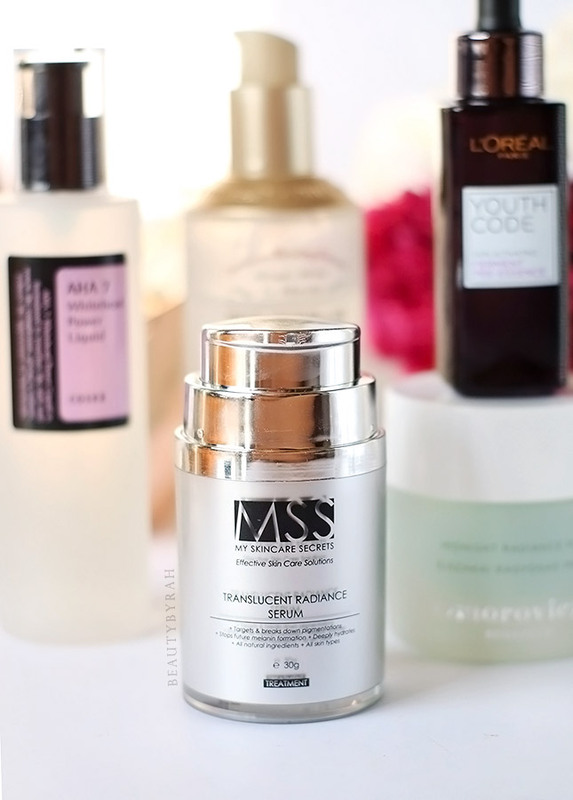 This retails for SGD $47.90 on My Skincare Secrets. Ever since turning 25, anti aging skincare has been on my radar and it's never too early to start, I feel. This is a pre-serum which you apply after cleansing and before any other skincare product as it helps to boost the effectiveness of the other products layered over it. This pre-serum is formulated with French Sea Water and natural essential oils that claims to aid in providing anti-aging benefits and moisture to the skin. The bottle is made from glass, thus it is a tad heavy and probably not suited for travelling. However, it does have a pump which works great in dispensing the product in a fuss free manner. 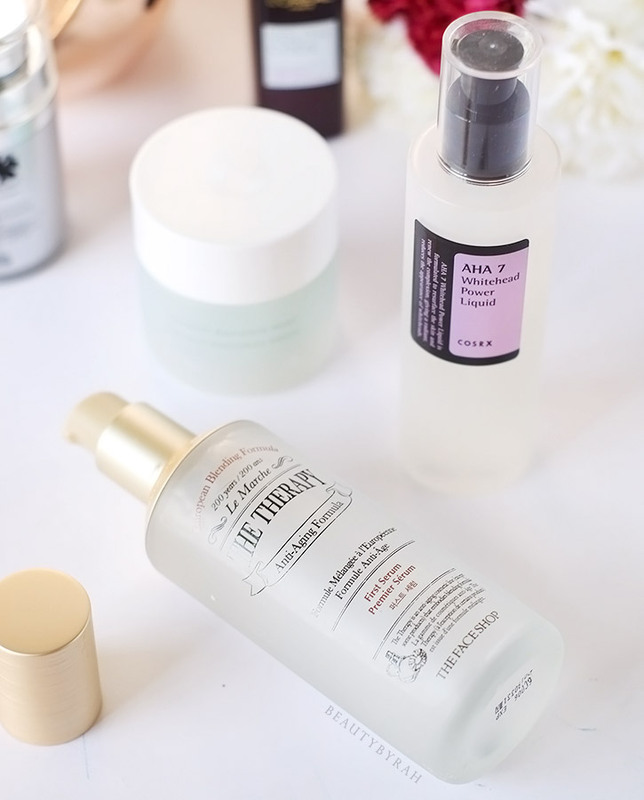 The serum itself is extremely watery, similar to essences such as the SK-II Facial Treatment Essence and the Missha Time Revolution First Treatment Essence. This gets absorbed into the skin almost immediately and does not leave any tacky residue behind. I do like how it feels and I do think that it helps improve the absorption of the skincare products that I layer atop it. I've been using this for about 1 month now, and I can say that my skin is feeling hydrated and looking more plump when I wake up. As a pre serum or first treatment essence, this is pretty affordable (especially when compared to the other ones in the market) and worth a try if you're on the hunt for one! I found this on Lazada Singapore for SGD 30! I wasn't joking when I said I got on the anti-aging skincare train. I love the Youthcode Ferment Eye Essence (review here) so I thought to give this a go. This pre-essence contains 98% ferment essence that is said to help to stimulate skin metabolism and accelerate cell renewal. It also contains pro-gen technology which claims to help skin's recovery ability against aging signs. This comes with a dropper which I think works great with its thinner and fluid formulation. I usually use about a third of a full drop and it is sufficient to apply to my entire face. This is meant to be applied after toner and before any serums, and its consistency is really that of in between. It does get absorbed quickly and I did not notice any sticky residue being left behind (do note that there is alcohol in this to help with the evaporation of the product). I have been using this for about 2 weeks now and I can't really tell much of a difference in my skin. I do, however, notice that my skincare products applied after are being absorbed more quickly (this could also be due to TFS First Therapy Serum, it's hard to tell). Overall, I am going to keep using this up and see how things go. This retails for SGD 41.90 at local drugstores but it usually does go on offer from what I've noticed! I am loving chemical exfoliants and since running out of my latest love, The Ordinary 10% Lactic Acid + 2% HA (more on that here), I chose to try something new that hopefully would give me the same effect. This CosRX Whitehead Power Liquid includes apple water (contains natural AHA) and Glycolic Acid. This helps to exfoliate the skin by clearing the dead skin cells faster by dissolving the bonds between them. This product also contains niacinamide and sodium hyaluronate which are both beneficial for the skin. It is extremely fluid; it drips down my fingers before I can usually get it onto my face. I was afraid that it would be too strong for my skin but I am glad to report that it isn't. I do feel an ever so slight tingling sensation on my skin on some days (especially around my nose area as I've been sick and have been constantly blowing it so the skin has been pretty sore), but no redness whatsoever. The scent is not pleasant, but it disappears in a matter of seconds so it is of no issue to me. I find my little whiteheads and bumps along my cheekbone to have dramatically reduced by using this and have been really enjoying it so far. My friend passed this along to me, but this is available on iHerb and Hermos (cheaper for those of you in Singapore)! This is an overnight gel mask from Omorovicsa that is meant to help brighten and smooth the complexion. Formulated with salicylic acid and sand lily, this mask helps to chemically exfoliate the skin as well as promote cell renewal and fight hyperpigmentation. Housed in a glass jar, the mask comes in a slightly opaque gel that goes onto the skin really nicely. I keep mine right underneath the air-conditioning, so when applied, it feels cooling and extremely refreshing on the skin. This is my first ever Omorovicza skin care product, and I was extremely excited to try it out! I really do like it so far. 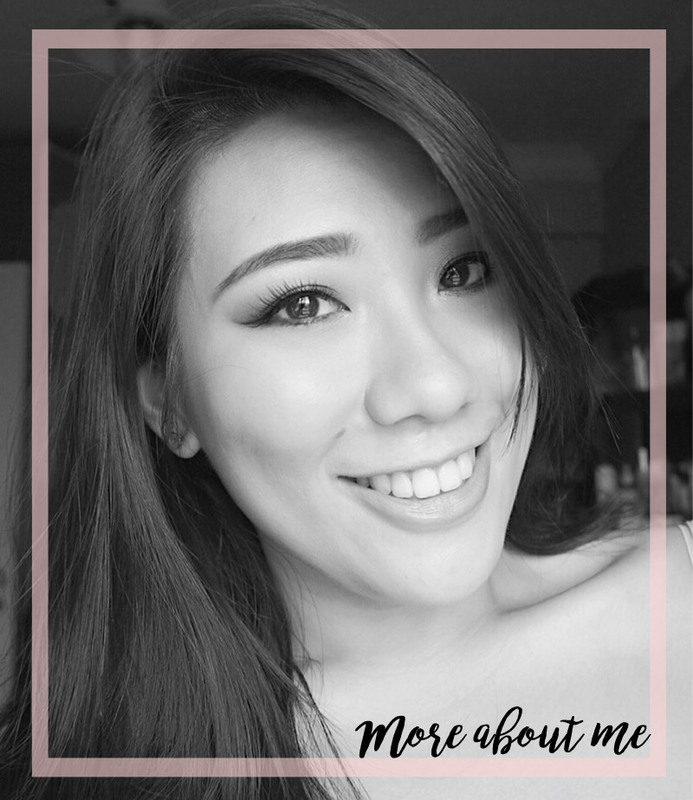 It helps to keep my skin hydrated (as it does contain sodium hyaluronate and red algae as well) and when I wake up in the morning, I do notice that my skin gives off a radiant glow. I like to use this before special days, such as the night before my Christmas party. 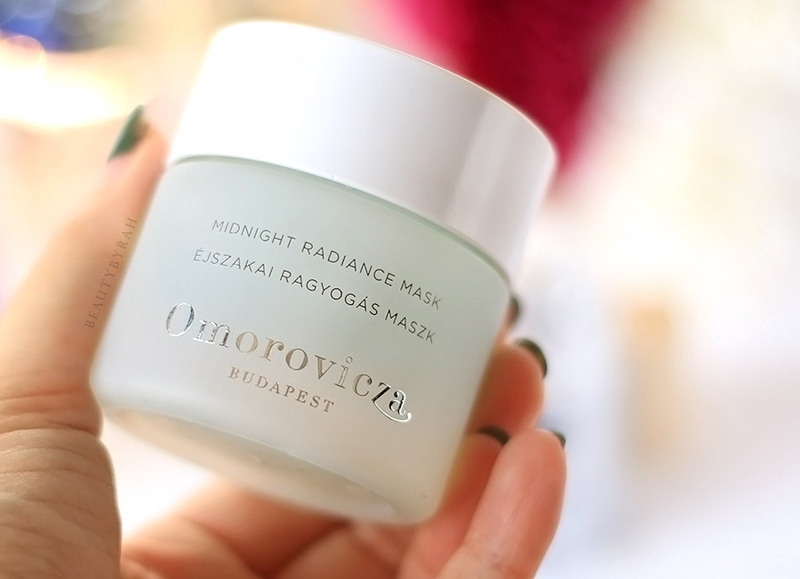 Omorovicza is a luxury skincare brand so it is pricey, but if you're wanting to splurge, I'd say check this out for sure. I really do enjoy it and I can actually see results with just one use (this is pretty rare!). This retails for SGD 165 on Look Fantastic, if you're interested. 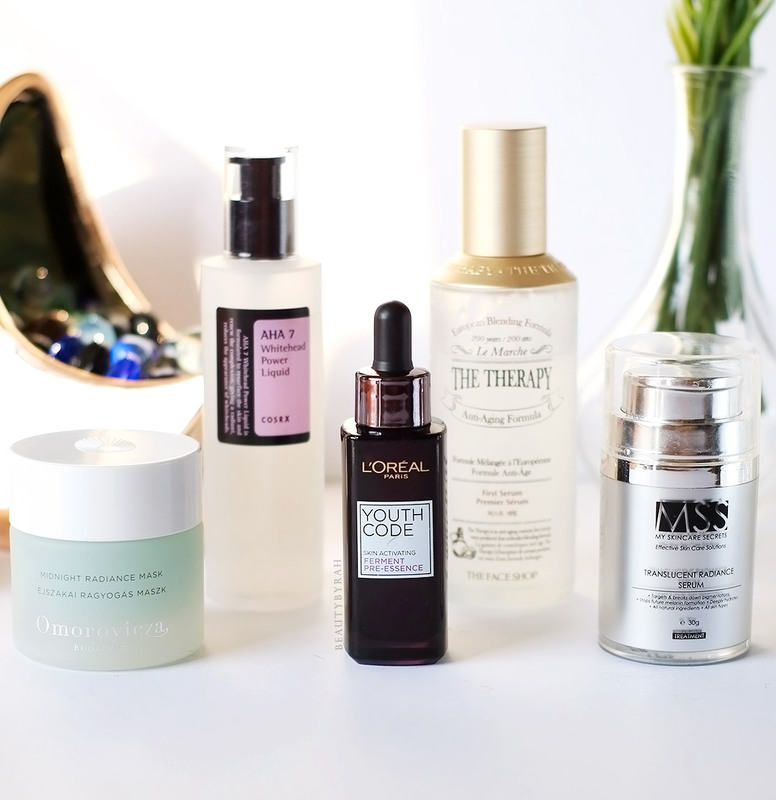 What are some skincare products that you are currently enjoying? I need some recommendations! ** PR / Gifted items. ** Look Fantastic is an affiliate link.